​Dressing like Howard Wolowitz is not exactly as easy as you may think. He has the most complicated style of all of the Big Bang Theory characters, and dresses almost like a “Nerd Rockstar”. ​Howard wears extremely tight, colorful pants with a western cowboy button up shirt over a dickey turtleneck. Sometimes he switches it up by wearing a polo, sweater, or even a turtleneck over his dickey turtleneck. The western shirt over the dickey is what I would consider the “classic Wolowitz” look. ​He often matches his entire outfit to his belt or belt buckle, like how some women match their outfits to their nails, purse, or shoes. Here is a breakdown of Howard Wolowitz’ style and where you can find the clothing items for yourself. What Kind of Belt Buckles does Howard Wolowitz Wear? 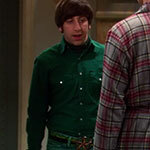 ​What Shoes does Howard Wolowitz Wear? Everyone loves Howard’s belt buckles and it seems like every episode he is wearing a wacky new one. ​A belt buckle is nothing I would have thought to include in my wardrobe, but they are actually a really good conversation starter … I am constantly getting compliments and asked where I got my belt buckles. Howard’s entire outfit centers around his belt and belt buckle combo. Like the rest of his clothing, his belts are colorful and loud. ​Howard wears colored leather belts, superhero style belts, and checkerboard Vans belts. If he is wearing a superhero belt you can be sure he has the belt buckle to match, otherwise, he mix and matches his belt and buckles a lot. ​The easiest would probably be the Vans checkerboard belt, since it only comes in one style. If you’re looking for the colored belts, check out the awesome color options on these JTC leather belts (perfect for the Wolowitz look). ​Want the nerdiest Wolowitz belts out there? Then you’re looking for the superhero belts. This Marvel themed superhero belt is pretty awesome, but if you just want a specific superhero on your belt, check out this Thor belt or this Green Lantern belt. Like Uncle Eddy from Christmas Vacation, Howard loves to wear dickey turtlenecks. ​If he happens to be wearing a short sleeved shirt, he wears a full turtleneck, like these long sleeve turtleneck shirts on Amazon. If you are unfamiliar with dickeys, they are like a fake turtleneck, they only cover the upper chest and neck (go here to check them out on Amazon). He wears the dickeys mostly under western style cowboy shirts, v neck sweaters, and button up western plaid shirts. ​Howard also on occasion will wear a short sleeved v neck shirt, and in those cases he wears a normal turtleneck. In the most recent seasons however, it appears that Howard is sticking more and more with the western plaid style shirt and dickey turtleneck look. The colors are mostly very bright and are coordinated with his belt. ​Finding exact matches for Howard’s shirts is definitely not easy. Many of his shirts are vintage and are obviously no longer sold in stores, unless you happen to find them in a vintage clothing store yourself. ​Many of Howard’s western plaid shirts are Urban Outfitter brand, but even with these their clothing line is constantly being updated. Unless you are looking for a shirt he is wearing in the current season, you may be out of luck. I do not think it is necessary to get the exact same brand as what he wears in the show to be able to wear the Howard Wolowitz style. Like the rest of his outfit, Howard’s pants are bright and tight. He primarily wears colorful skinny cotton twill pants and he wears them as tight as possible. He also wears skinny jeans on occasion, but the colorful pants are what I consider the “Wolowitz look”. ​Again with just some searching on Amazon, I was able to find these J. Tomson and LE3NO brightly colored, tight fitting twill pants. Howard is definitely a “Vans” man. His favorite pair are his white and black checkerboard slip on Vans. He also has several other pairs in many different colors to match his belt and belt buckle. He prefers the slip on Vans over the laces, but unfortunately those do not come in every color so he resorts to the laces when needed. ​If you want the checkerboard Vans, they have them here on Amazon. They also carry the Vans laced and Vans unlaced slip ons. ​If you are creating a Howard Wolowitz Halloween costume or Cosplay costume, it simply is not complete without that infamous Howard Wolowitz “bowl cut”. ​I used this same wig (pictured on the right) for my costume and was very happy with it and the costume would not have been the same without it.